And the Coasters face two trips to the South West in rapid succession. They meet the same opposition in the Vanarama Nationl League North on December 17 – so the two sides will meet twice on the same ground within the space of three weeks. Gloucester play their home matches at Whaddon Road, which is also the home of League Two side Cheltenham Town. “But we knew before the draw was made that we would be playing someone of our own standard. One player who will not figure in the trip to play Gloucester is defender Macauley Wilson, who was signed on loan from Blackpool late last week and made his AFC Fylde debut in the 1-1 draw at Darlington on Saturday. He is cup-tied having played for Bamber Bridge earlier in the competition. Wilson did not train with the rest of the Coasters’ squad on Monday as he was showing signs of ‘flu and missed out as a precaution. The well-regarded Wilson played his first match in Fylde colours during the meeting of the National League North’s top two. Challinor said: “He did OK in what was something of a baptism of fire for him because we were under the cosh in the second half. The loan is initially for a month and whether it is extended could depend for a large part on how he fits in at Mill Farm. Meanwhile, Dan Bradley believes the Coasters’ hard-fought point earned against Darlington at the weekend could prove to be crucial. They maintained their four-point lead over the highly-fancied North East outfit after a 1-1 draw at Heritage Park despite coming under intense pressure in the second half. The Coasters made a bright start to the match when Danny Rowe fired home Fylde’s 50th league goal of the season before Josh Gillies levelled. 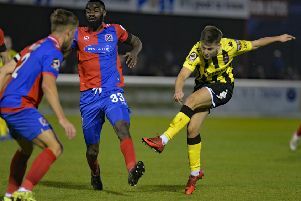 “Obviously, Darlington is going to be a tough place for a most teams to visit this year,” Bradley said: “We were under the cosh a lot in the second half but I have to give massive credit to all of the lads. “We dug in and whether we deserved it or not, we got a point against one of our biggest rivals and that could be massive come the end of the season. “I think that we’re a little bit disappointed that we didn’t play our own game. “I think we got dragged a little bit into the way that Darlington played and we couldn’t get our usual rhythm going. “They played long balls into the box and were competing for second balls and things like that but, on the other hand, we dug in and managed to hold on for a point in the end.